USAID is helping hundreds of farmers here. But millions more battle drought and climate change on their own. This is the fourth of several blog posts written from Dar es Salaam and Morogoro, Tanzania. I’m visiting Tanzania thanks to CARE USA, which has paid for my trip with the help of a grant from the Bill and Melinda Gates Foundation. Its purpose, for me at least, is to explore one country’s need for humanitarian aid and development assistance and to examine America’s political will and commitment to deliver on its promises. The impact of American development aid to Tanzania, and the vast distance yet to go, were both evident in abundance during the fifth, and last, day that I spent in Tanzania. In the morning, we flew from Dar es Salaam to Morogoro, a one-hour flight from the capital in a twin-engine Cessna but a world away. Nestled at the center of a group of five Tanzanian districts, Morogoro is a bustling town with a busy marketplace and a network of paved thoroughfares that lead to dirt roads leading in every direction. But the primary activity here, among the 2 million people who live in the five districts around Morogoro, is agriculture. When I asked Mvomero district’s Anthony Mtaka, the district commissioner—the equivalent of a state governor in the United States, though appointed by President Kikwete—what percentage of the 300,000 people in his district were farmers and peasants, he didn’t hesitate. “Ninety-nine percent,” he answered. As in most of Tanzania, the majority are desperately poor, subsistence farmers. Nearly all of them farm tiny plots, growing barely enough to feed their families, if that, and few have any substantial surplus to bring to market. One exception is the Uwawakuda irrigation cooperative farm. More than 900 Tanzanian farmers, including 414 women, have banded together to farm a 5,000-acre spread whose productivity is fed by a pumping station and irrigation system that provides underground water to the farm. Originally installed three decades ago during the era of Tanzania’s president and founder, Julius Nyerere, the pumps are creaky now, and thanks to a grant from the US Agency for International Development (USAID) new ones are being installed. It’s a star attraction for USAID’s Feed the Future program. According to the local officials who run it, the American help will rebuild the pumps, pave an access road, and rehabilitate the drainage canal that supplies the network of rice farms in the complex. 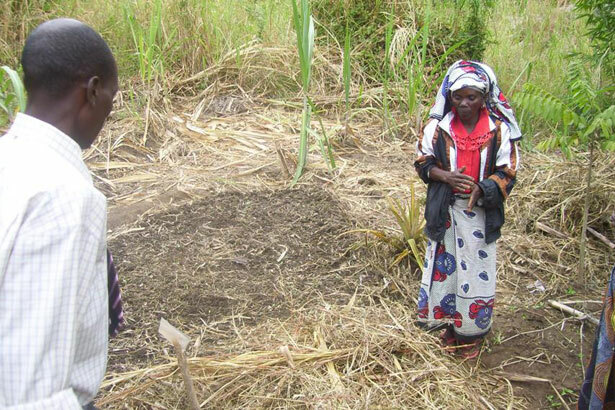 In addition, USAID has put in place a model farm that teaches members of the coop the best practices in rice farming. A phalanx of women farmers greet us as we arrive at the model farm, singing and clapping and performing a series of original songs they’ve prepared for the occasion, and one of them, Victoria, with tears in her eyes, describes a litany of gains she’s been able to achieve as a member of the relatively prosperous coop, with USAID’s assistance. Problem is, for the rest of the 2 million people in and around the area, things are bleak. A drought, worsened by climate change and rising temperatures, has wracked the region. When I asked George Iranga, who manages the project, what happens to the farmers outside the coop, who don’t have access to irrigation, he says that they are struggling. That’s an understatement. Iranga says that the government in Dar es Salaam would like to replicate the gains in Uwawakuda elsewhere, but there’s no money. “Our government is doing its best to look for funding, or supply it from its own resources,” he says. Mtaka, the district commissioner, himself is a farmer, and last year he lost a great deal of money on his own farm. “We have year-round rivers here, but there is no way to get the water to the farmers. What we need most of all is irrigation technology here. If the rain doesn’t come, the farmers collapse financially.” The districts have sixteen irrigation plans on the books, and no way to fund any of them. “The demand is too high,” says Iranga. “The government will allocate each year small bits of what’s needed.” Of course, it falls far short. Back in Washington, USAID points to prgrams like Uwawakuda as success stories, and indeed they are. But compared to the staggering needs of a nation such as Tanzania—and multiply that by dozens of other counties across the globe—it’s a drop in the bucket. Representative John Garamendi, a California Democrat with long experience in Africa, was part of the group visiting Tanzania organized by CARE. He says that while military-related foreign assistance is popular in Congress, humanitarian and development aid is more difficult to build support for, especially in the era of sequestration and budget cuts. “It’ll be a challenge,” he says. And while he supports the idea of increasing aid, he recognizes that it’s a uphill climb. Tanzania, he says, has made substantial progress. “But there’s a huge need.” The United States, along with the rest of the developed world, through the so-called G-8, provide development and humanitarian aid, help build Tanzania’s roads, water systems and infrastructure, facilitate direct forieign investment, and more, he says. Still, in the current Washington political climate, there’s little or no chance that Tanzania will see a substantial increase in US foreign aid anytime soon. Although the United States has committed to supplying 0.70 percent of its GNP in total foreign assistance, the current actual figure is a dismal 0.17 percent, less than one-fourth of what ought to be. Until that changes, the two million farmers around Morogoro will have to deal with drought, climate change and many other problems that plague them—and that condemn Tanzania to stagnation, with more than a third of its population living on fifty-eight cents a day—pretty much on their own. In his previous post from Tanzania, Robert Dreyfuss wrote about getting more bang for the foreign aid buck.